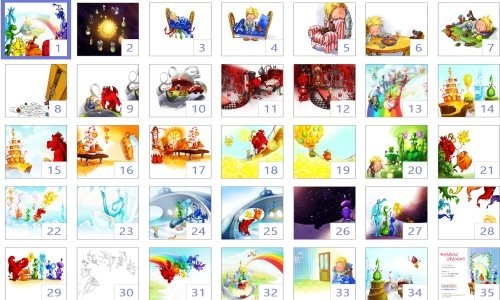 Rainbow Dragons is a free Windows 8 eBook app available under the ‘Books & References’ of Windows 8 store. This eBook app for Windows 8 has been designed especially for kids to experience the interactive reading along with animations on all the pages. Not, only can you see the beautiful animations, but also you can hear the story aloud to enjoy while going through the eBook. This Windows 8 eBook has a story about unique characters where seven dragon brothers run off from their villa to form a Rainbow Bridge on the beautiful planet Dra-Dra. There are people who come on to the planet of dragons while dreaming use that Rainbow Bridge to go back to Earth. Similarly, there a sweet little boy who is very sleepy and can sleepy anytime, anywhere. Once, he got lost while dreaming and checked into the Dra-Dra Planet. But, on that very day the dragons had a quarrel.. read the entire story to know what happened next. As you open the Rainbow Dragons app, you will see a beautiful screen where in the box given at the right bottom side, you will see a ‘Play’ button. Click on that play button to start listening to the story and to view the animation. It will quickly bring you a plain screen where you it will be difficult to find any button. But, hold on.. there is a button. At the bottom right-side, you will see a tiny ‘—‘ button. Click on that button to view all the parts of this story in a thumbnail format. You can now select any part to hear the story or to read it yourself. There are 35 parts. Now, in case you want to stop listening to the story, click the right mouse button anywhere on the screen ? this will open a horizontal panel at the bottom of the screen. Click on ‘Stop’ button to stop the audio. Here, you can also change the language in which you want to read or listen to the story. While, to go back to the home, just click on ‘Home’ button given on this horizontal panel itself. Press ‘Win+Q’ combination to open the search bar. Type ‘Rainbow Dragons’ in the search bar and press enter. Soon the app will be in front of you. Click on ‘Install’ button to install the Windows 8 eBook app. In short, Rainbow Dragon is a nice eBook app for Windows 8 that works really well for kids learning and reading while having fun. Go ahead and search for Rainbow Dragons now.